Today LaCie announced a new 2-bay network-attached storage solution (NAS) that delivers the ideal combination of speed and security for small businesses – the LaCie 2big NAS, design by Neil Poulton. Powered by a 2GHz processor and improved file system, the 2big NAS delivers speeds up to 100MB/s, ensuring employees can share files from any PC, Mac, or Linux workstation. "According to data from Research and Markets, network storage is growing in excess of 30% annually, increasing the demands placed on network storage devices," said Erwan Girard, Professional Business Unit Manager at LaCie. "The LaCie 2big NAS was developed to scale with the needs of SOHO users, delivering fast file sharing and data security, the two most critical factors for a small business." In a data-dependant world, small offices can't afford delays in workflow. The 2big NAS supports non-stop data accessibility and collaboration thanks to its 2Ghz processor and LaCie NAS OS 2 software. It delivers enough storage capacity and bandwidth to back up multiple workstations, share large files and work on projects concurrently. Because data multiplies by the second, office administrators and IT professionals must ensure all digital assets are backed up and secure. The LaCie 2big NAS offers multiple levels of security including RAID 1 for data mirroring. Coupled with its hot-swappable drives, a failed disk can be replaced with no interruption, no data loss and without needing to turn off the device. The LaCie 2big NAS ensures a complete backup of any Linux, PC or Mac workstation. 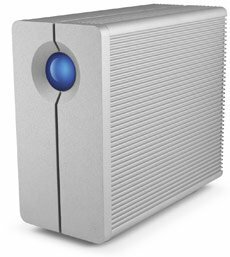 Choose from the popular Time Machine and Windows 7 Backup software, or the included LaCie backup software. Consistent automatic backup means users can restore lost files instantly. What's more, LaCie's NAS OS 2 dashboard makes it easy for businesses to back up the 2big NAS automatically, for added data security and peace of mind. Wizards with presets make advanced tasks such as RAID management, users management and NAS-to-NAS backups easy. No IT degree required. With just a few clicks users can back up the 2big NAS onto a direct-attached external hard drive, or schedule a nightly backup onto a NAS in a different location. Complementary to fast file sharing and data security is instant access to your data. The 2big NAS allows employees to access important files anywhere where there is an Internet connection. They can even download the free iOS app – LaCie MyNAS – to access files from an iPhone or iPad. The LaCie 2big NAS saves businesses money by allowing full control of its energy usage. Users can schedule shutdown and restart during optimal business hours to boost efficiency. Plus, the LaCie 2big NAS is now ten times more energy efficient when in deep sleep mode. And, thanks to the wake-on-LAN protocol, users can access the 2big NAS from deep sleep without being next to the system. The LaCie 2big NAS is available in 0TB and 6TB capacities through the LaCie Online Store, LaCie PROgram+ Partners and LaCie PROgram+ Resellers starting at $299.00. For more product information, visit www.lacie.com.